I like to get my BoHo Home articles done in advance and watch them post automatically while I work on something new. What can I say? I’m a bit of type A. But lately I’m behind or, worse yet, barely making it. Tuesday’s article didn’t post until mid-morning—ACK! And I haven’t gotten ahead of myself now for more than a week. The reason? It’s been boho-busy around here, what with spring cleaning and a host of other household projects I’ve created for myself. Oh yeah, and Chris is struggling with an irritated tendon in his leg, so we’re both on canes for the time being. His injury means some of my projects have to wait. In the meantime, I thought I’d update you on one very big thing I did accomplish: another bookcase revamp. While Chris whipped through the rest of the house (and overdid), I struggled in place in my office. That’s not to say I didn’t accomplish anything. 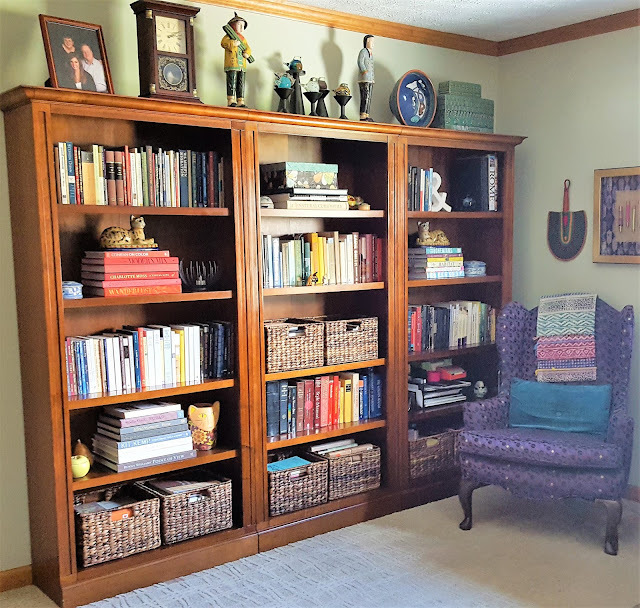 I removed every book from its shelf, thoroughly cleaned and polished the bookcases, then reorganized, reshelved and restyled. Voila! Looks great, huh? If you remember, I just did this in October. But that arrangement took on the messies faster than I anticipated. This side-by-side comparison shows how the bookcases have morphed over time. The middle one looks very stylish, I agree, but it didn’t function so well. Seems like as soon as I finished reorganizing it that way, I started making changes again. 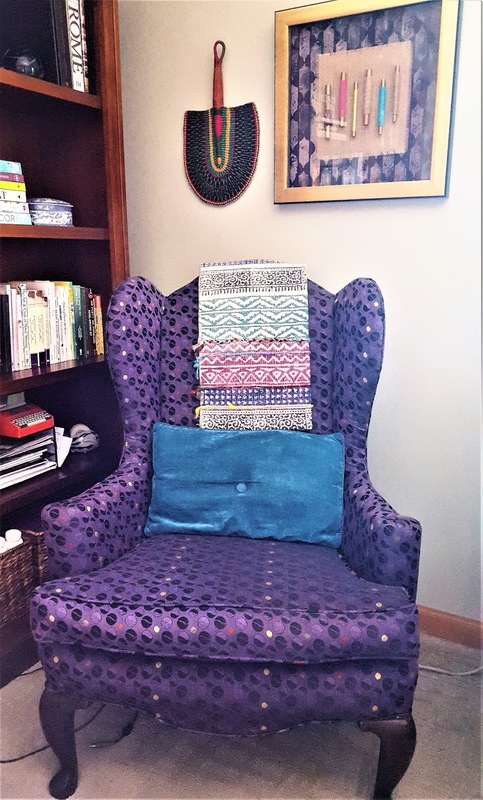 I do most of my writing in that purple wing chair, with my laptop on a small portable desk. That basket near where my right arm would be was chock full of stuff—mostly vitamin supplements—and I wasted a lot of time searching for pens, pencils, notepaper AND vitamins. So I added an organizer, which shared the shelf with the basket, and neither one was easy to use. There isn’t a photo to support it, but trust me. But let’s not jump ahead. 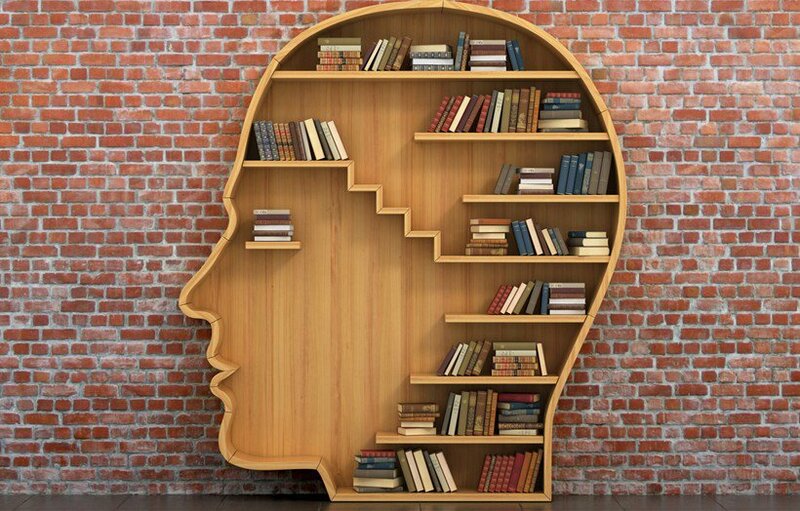 I don’t know if it’s apparent from the photos, but fewer books are now displayed on the shelves. They’re all still there, but inside the baskets. Before, craft supplies filled the baskets. I went through those, pitched what was no good and moved the rest to a cupboard. I then put in the baskets books I wanted to keep but didn’t access often. I also relieved all books of dust jackets and ferreted the paper covers away in a closet in case I change my mind. This was an idea I got from designer Kit Kemp in her book, Every Room Tells a Story. It creates a more cohesive look from afar. 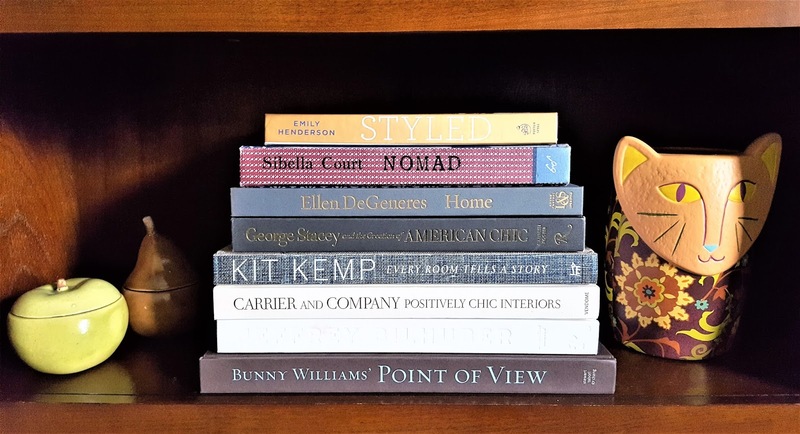 As you know, Type-A Me likes her books arranged by genre, so all poetry, essay and memoir are still alphabetized by author (now on the first and third shelves of this first section). 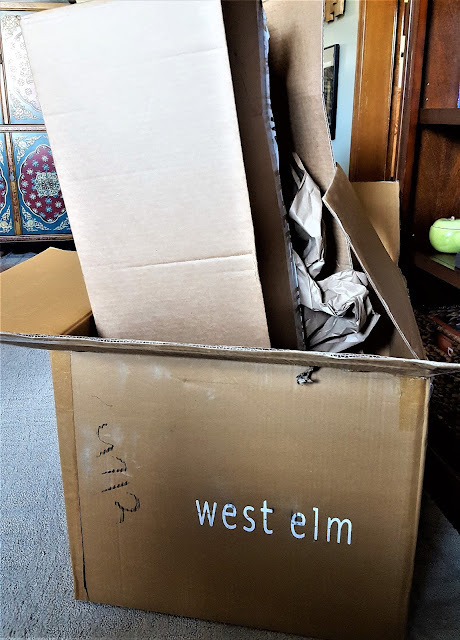 I could not abide all my slim, mostly paperback, volumes of poetry stacked vertically as I arranged them in October—too hard to get in and out of, too difficult to keep neat. I then arranged multiple volumes by the same author according to color. I have to admit, it IS somewhat easier on the eyes. I can’t do all my books by color, but I take back any aspersions I’ve previously cast about such an organization scheme. It certainly has its pluses. 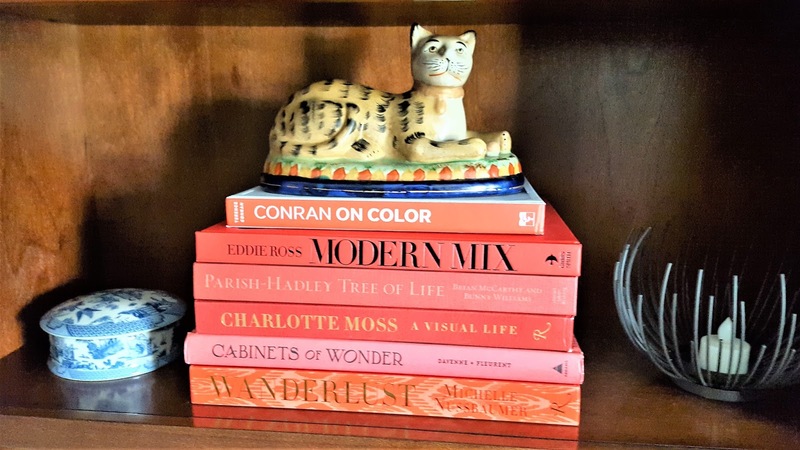 Vertical stacking is great for the larger, hardback coffee-table books. I divvied these up by color as much as possible and used the extra space on these shelves to display some of my pretties. How about that gorgeous cat I scored on Ebay? She’s one of pair; you’ll see her mate in section three. No room for anything on top of this stack, but the sides are filled out nicely with items I’ve had in storage way too long. Fiction, reference and other nonfiction fill the middle section, with cookbooks, craft books and extra notebooks occupying the baskets. Again, where I could, I arranged by color. 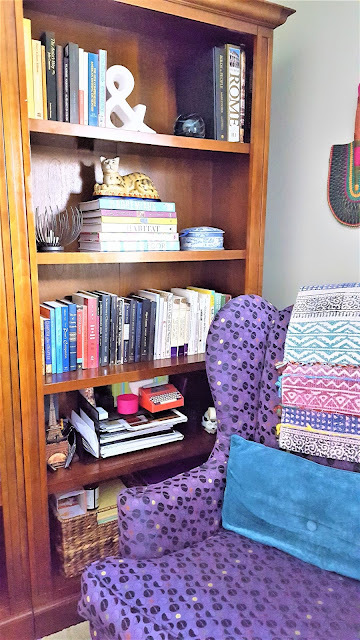 The third section includes a shelf devoted to books about writing, as well as an overflow of other nonfiction.There’s the mate to my Ebay kitty on top of that stack! I love these cats so much; I smile every time I see them. Note also the close-up of my organizer on a shelf by itself and my supplements tucked away with my paper supply in the bottom basket. Neat and tidy, like my momma taught me! If you have bariatric surgery, you take a lot of vitamin supplements FOR LIFE. This chair is also where I sit to set up what I’ll take each day, which I then put into that pink cup. It’s easier to see what I’m reaching for now. In fact, everything functions better for me all-around. I also added art above this chair since last you saw it—this shadowbox (it’s on sale now!) and a fan from Ghana—as well as a small handwoven rug, which packs some textural punch draped over the chair back. I could rename this Cord Corner, since this area is the hub for a spaghetti plate of recharging devices. But it’s nothing compared to the stack of boxes left from yesterday’s deliveries. What was in them? Well, that will be the subject of another post. I need to rest on the laurels of one completed project before I take on another. But stay tuned, either by subscribing to BoHo Home, using one of the services at the bottom of the page, or follow my blog with Bloglovin. Happy First Saturday of Spring! !